The warm weather always means more opportunities to do things outside. We started the month off with our annual Iron Chef camp out. This year we headed to Camp Ockanickon in Buck’s County. It wasn’t all about cooking, we had a chance to go on a hike, practice our outdoor skills, play some GaGa and just have fun! This year’s IC pitted members of the Titans and the Council of Ricks against the older, more seasoned veterans from the Venomous Cobras and the Border Patrol. The theme this year was Cinco de Mayo. The two teams began cooking their appetizers, entrees and desserts at 4 p.m. in order to be ready to present to the judge at 6:30. At 5, the secret ingredient – chocolate – was introduced. The Titans/Ricks were lead by Justin and his sous chef Zach. They began their presentation with their appetizer of chips and homemade guacamole, followed by their entree of tacos with fried tortilla shells and a rice side dish. They topped it all off with an amazing apple dump cake for dessert and had Nick’s famous lemonade to wash it all down. Not to be outdone, the Cobras/BP presented their cheese covered nachos with salsa for their first course. George did a great job explaining the dish and its nuances. Their entree was then unveiled – a chicken enchilada – followed by a dessert of a glazed donuts covered with chocolate, bananas and whipped cream. Carrying through the Cinco de Mayo theme, they had virgin sangria for a beverage. It was a very difficult decision but in the end, the Ricks and Titans emerged victorious with their homemade touches putting them over the top even though the judges were heavily swayed by the enchiladas and dessert. It was a great competition and the Scouts did a great job mastering their cooking skills. 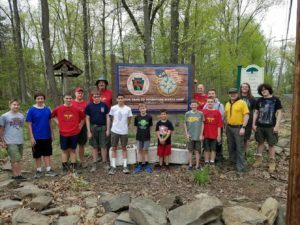 This is a Troop 200 tradition where the scouts learn skills that will help them in their futures. 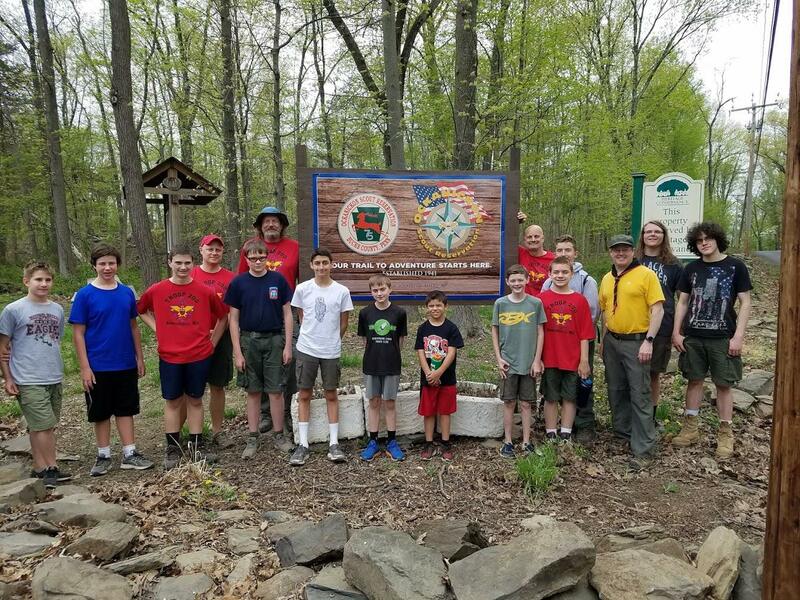 We were happy to celebrate the accomplishment of one of our Scouts, Dillon, at his Eagle Court of Honor held at Camp Tecumseh. You can learn more about his project here. Dillon became our 88th Eagle Scout. Congrats again, Dillon! 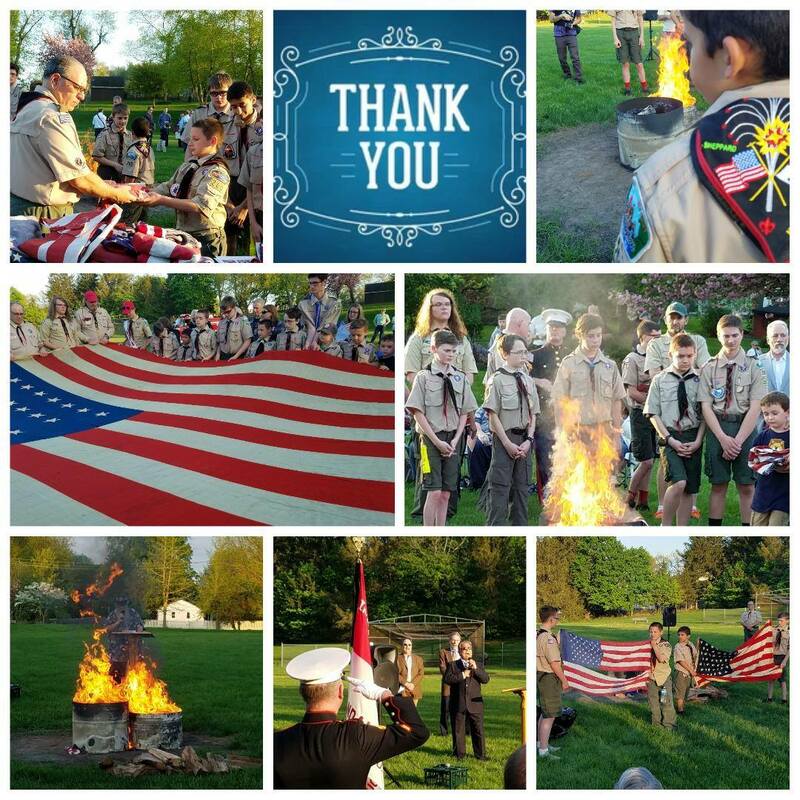 On May 7th we held a Flag Retirement Ceremony at Holjes-Sheppard Park in Lebanon Borough. 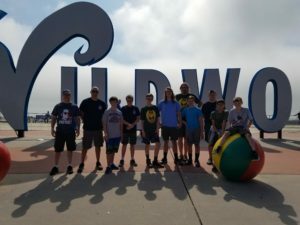 It was an amazing event with over 150 people attending including members of the military, members of Rolling Thunder and other veterans groups, local Cub Scouts, friends, family and community members. Mayor Reino from Lebanon Boro unveiled the new POW flag that will fly in the park. Our former Scoutmaster and local flag expert, MOAT Friend was on hand to share some of his flag knowledge with us. Mark Paradis, a veteran, played TAPS on his bugle. 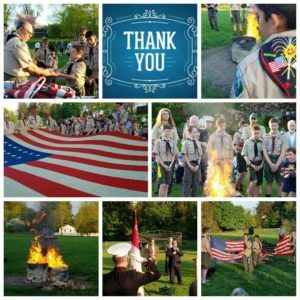 It was just an amazing night…and what made it even more special to us was the fact that it was in the Park that is named in honor of two of our scouts – Fred Holjes and Robert Sheppard – who were both killed in Vietnam. May 7th marked the 48th anniversary of Robert’s death. We want to thank everyone who came out, who donated flags and supported us during this very special ceremony and look forward to next year’s event. A t one of our regularly scheduled meetings one of our past ASMs, Mr. Paulmeno (a retired NJ State Police officer) came to help us work on the Emergency Preparedness merit badge. This badge is required for Eagle Scout and we’re happy that Mr. Paulmeno stays connected to our troop. 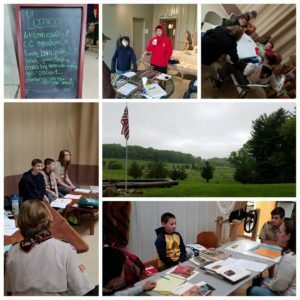 In mid-May we held a Merit Badge Fair at Valley Crest Farm and Preserve. Over 80 scouts from across NY, NJ and PA attended. The weather was rainy but that didn’t stop us from working on requirements for 19 different badges. Thanks to Valley Crest and Mr. Fodera and Mr. Maslanka for making this happen. We appreciate all you do for us. Throughout the month Mr. Marosy held a bunch of Scoutmaster Conferences and many of us passed our Board of Reviews…just in time for the Spring Court of Honor in June! Thanks to everyone who is helping us on our journey to Eagle!